WIN Network: Detroit is excited to announce we have been chosen as the recipient of this year’s “Hillman Innovations in Care” funding award from the Rita and Alex Hillman Foundation, which will allow us to not only continue operating our group prenatal care program for the next 3 years, but will also allow us to expand our reach to Dearborn, Michigan. This award is given to organizations demonstrating innovation in the nursing field. In the past two years, the Innovations in Care award has been awarded to two recipients each year, however, this year WIN Network: Detroit was the sole winner of this grant funding. Our enhanced model of group prenatal care is the first in the country to join a Certified Nurse Midwife (CNM) and a Community Health Worker (CHW) to co-facilitate group sessions. Groups of 8-12 pregnant women all due to give birth around the same time gather for 10 group prenatal care where they receive both clinical care and prenatal education in order to prepare for a healthy pregnancy, birth, and baby. WIN Network: Detroit targets a population of African American women in Detroit, aged 18-45, to reduce racial disparities in infant mortality. Elikem Amable, a Certified Nurse Midwife who serves WIN Network: Detroit group prenatal care patients, holds a new #DetroitWINNER baby. In partnership with Henry Ford Health System Women’s Health, Certified Nurse Midwives provide WIN Network: Detroit participants with the highest quality of clinical prenatal care, and Community Health Workers address the social determinants of health that may be impacting a mother’s pregnancy. Throughout the pregnancy, group prenatal care moms receive one-on-one home visits with their Community Health Worker that continue until the mother’s baby turns one year of age. By combining the skills and expertise of both the Certified Nurse Midwifery profession and Community Health Workers, CNMs are better able to treat their patients and their individual needs, incorporate attention to social needs into their clinical care, they have more time with their patients, and are able to operate at the top of their clinical license. With this new funding, we are able to bring new Certified Nurse Midwives into our model of group prenatal care, expanding the reach of vital midwifery services throughout our community. Group prenatal care moms and their babies pose for a photo with Certified Nurse Midwife Char’ly Snow, and Community Health Worker, Felicia Lane. Since beginning group prenatal care in 2016, more than 120 babies have been delivered after completing the program. These babies have an average birthweight of 6.89 pounds and an average gestational age of 38.6 weeks. 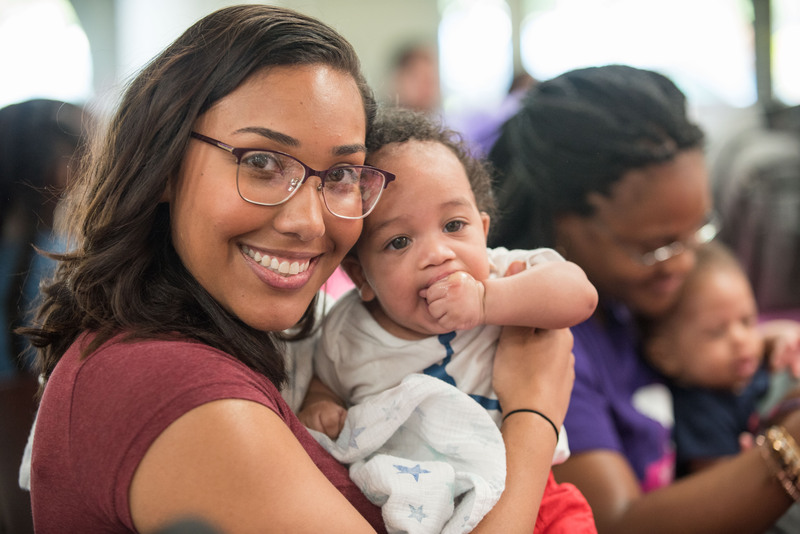 93% of WIN Network: Detroit’s group prenatal care mothers initiate breastfeeding, and 109 fathers have attended at least one group prenatal care session with their partner. In 2019, we will prepare to expand our model of enhanced group prenatal care to a Henry Ford Health System location in Dearborn, Michigan. Much like Detroit, Dearborn suffers from vast disparities in preterm birth rates and infant mortality rates between black and white babies. Group prenatal care is an evidence-based model that is proven to reduce disparities in birth outcomes for black women specifically. In July 2018, WIN Network: Detroit was visited by Rachael Watman, Vice President of Programs for the Hillman Foundation, for a site visit. Rachael shared that our application was “head and shoulders above the rest,” and also commented on how marvelous it was to see the passion, energy and teamwork between the CNMs and CHWs. Co-Principal Investigators for this project are Cathy Collins-Fulea, MSN, CNM, FACNM, Division Head of Midwifery for the Henry Ford Health System, and Kimberlydawn Wisdom, MD, MS, Senior Vice President of Community Health and Equity for the Henry Ford Health System. 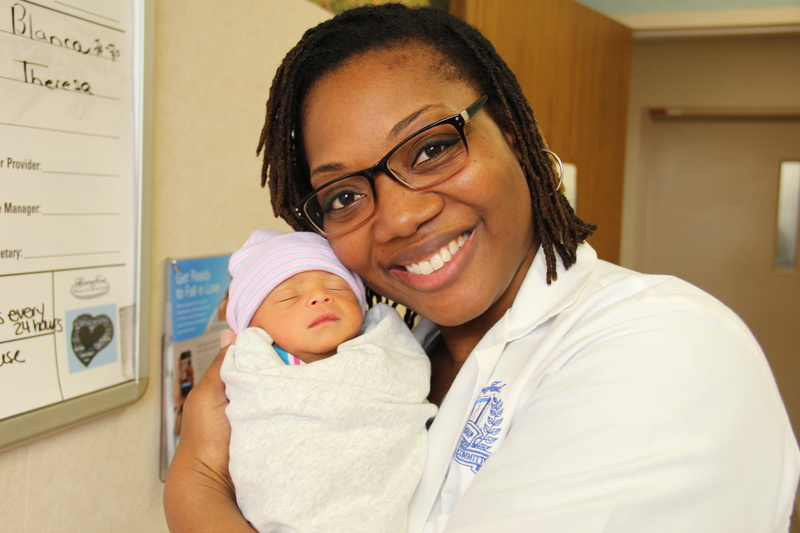 WIN Network: Detroit mom, Ariel, holds her group prenatal care baby. We are so honored to receive this award. It is a testament to the hard work and passion of our Certified Nurse Midwives, Community Health Workers, community partners, and everyone working behind the scenes in administration, evaluation, and research, to make WIN Network: Detroit successful in helping women and families thrive. The Hillman Innovations in Care grant totals $600,000 over three years. Launched in 2014, the program is one of the Foundation’s defining initiatives and supports bold, evidence-based interventions that improve the health and health care of vulnerable populations, including the economically disadvantaged, racial and ethnic minorities, LGBQT, the homeless, rural populations, and other groups. Read the Rita and Alex Hillman Foundation’s press release regarding this award here. Learn more about our enhanced model of group prenatal care here. Read success stories from group prenatal care participants here. Follow us on Facebook, Twitter, and Instagram for program updates.